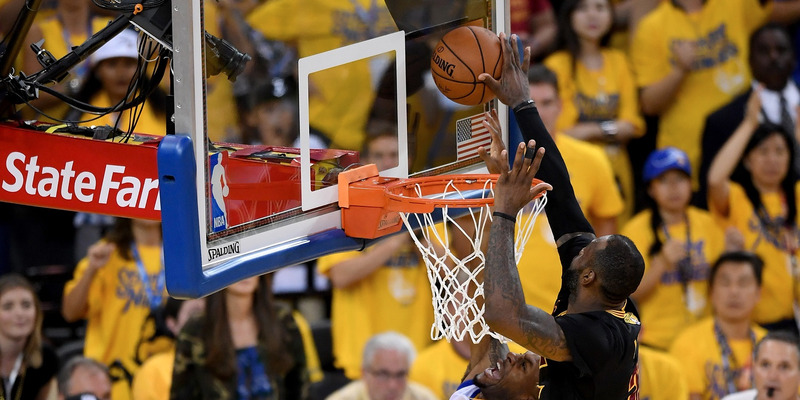 LeBron James came through with what may go down as the greatest block in NBA history in the final two minutes of Game 7 of the NBA Finals. With the game tied at 89-89 with just under two minutes left, James chased down Andre Iguodala on a fastbreak, rose up, and swatted Iguodala’s layup off the glass, preventing what seemed like two automatic points. It proved to be a game-saving play, as the Warriors didn’t score again the rest of the game, instantly vaulting James’ play as “The Block” in Cleveland sports history. While the play was jaw-dropping by itself, ESPN’s “Sports Science” broke down the play further, highlighting the incredible athletic feat by James. LeBron hit a top speed of 20.1 miles per hour while chasing down Iguodala. According to Sports Science, James began the play trailing Iguodala by 88 feet. He made that distance up in about three seconds. He rose up 35 inches off the ground and got his hand over 11 feet to block the shot. Considering that James had already played about 45 minutes at that point, it’s incredible he was able to still jump so high. The Cavaliers spent much of the season preserving LeBron and monitoring his minutes. It obviously paid off with fresh legs that allowed him to create one of the most incredible plays in NBA Finals history.